The lamps hang from the ceiling of the stall, glowing like a constellation. Different shapes, varied sizes, a range of colours. Each on their own is a work of art – together they become a gallery of light. Such is the Grand Bazaar of Istanbul. At the centre of the old city, undercover and along ancient alleyways, it was once the heart of the city’s trade. In fact, it was at the heart of much of the world’s economy for decades – the bridge between Europe and Asia culturally and commercially. These days it’s more about tourism than trade… but more on that in a second. From another stall, the smell of spices waft between the passing crowds – no need to shout out, its presence is unavoidable. 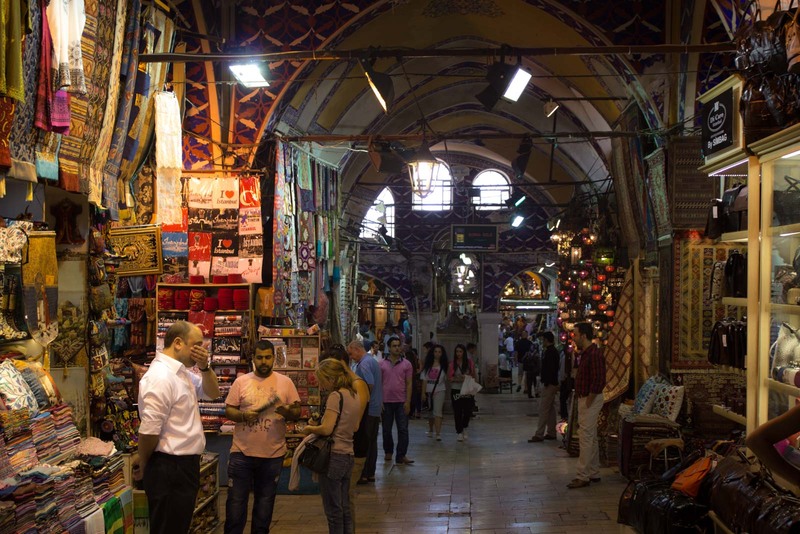 There are more than three thousands shops in Istanbul’s Grand Bazaar. Over the centuries, it has grown in size and evolved with the changes of society. The first form of the market was built in the fifteenth century and was originally used for textiles. It has been the centre for books, jewellery, furniture, food – even slaves. Now it is a mixture of everything… except the slaves, of course. It’s sometimes claimed that the bazaar is the most-visited monument in the history of the world, in terms of total visitors. Every day there are between 250,000 and 400,000 people who walk under one of the small stone arches into the labyrinth complex. A lot of them are tourists – but not many are there to actually buy something. And that’s the problem for many of the vendors. Yes, they will make a living, but they have to balance their business with the feeling they are simply animals in a zoo. About 26,000 people work here but thousands of them will spend their days drinking their tea, smoking their cigarettes, waiting for customers. 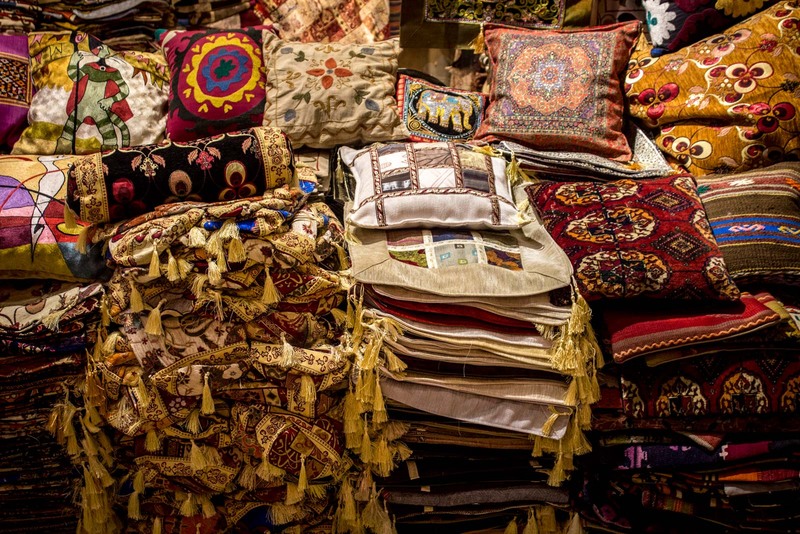 How many serious carpet-buyers would actually head to the Grand Bazaar to get the best quality at the best price? Photogenic, not affordable, is the word of the day. Still, this is about as iconic as the city can get. It’s a place where history has morphed into the present, where local culture has intertwined with tourism, and where there’s a rare vibrancy for a landmark so old. 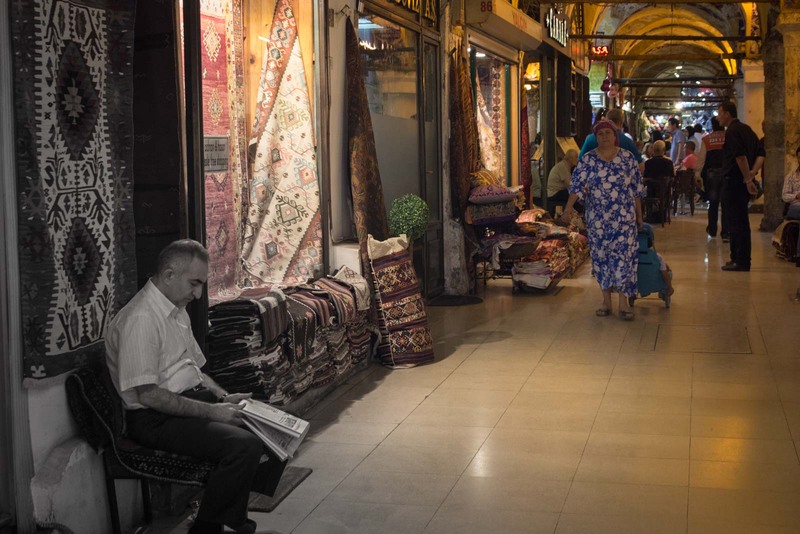 The cheaper shops – the ones the locals go to – have spread out into the streets around the Grand Bazaar. If you’re looking for a bargain, try to find what you’re looking for in the roads down towards the port. But for the lamps, the soaps, the spices, the dresses, the carpets, the necklaces, the trinkets, and everything else that glitters and inspires, there’s nothing quite like Istanbul’s undercover metropolis. Certainly a contrast for the vendors. Sure, you’ve got the traffic any retailer desires, but if no one’s a buyer what difference does it make? I think they’re earning enough of an income to make it worth their while – otherwise why would they bother, right? But the traffic walking past certainly doesn’t reflect the amount of sales they’re getting. Looks like a fun place to explore. Recently spent 5 hours at the airport in Istanbul not one of my best experiences but I hear the country is great. What a pity you couldn’t have popped out to the bazaar. It would have been a much more enjoyable way to pass those hours! Great photos! 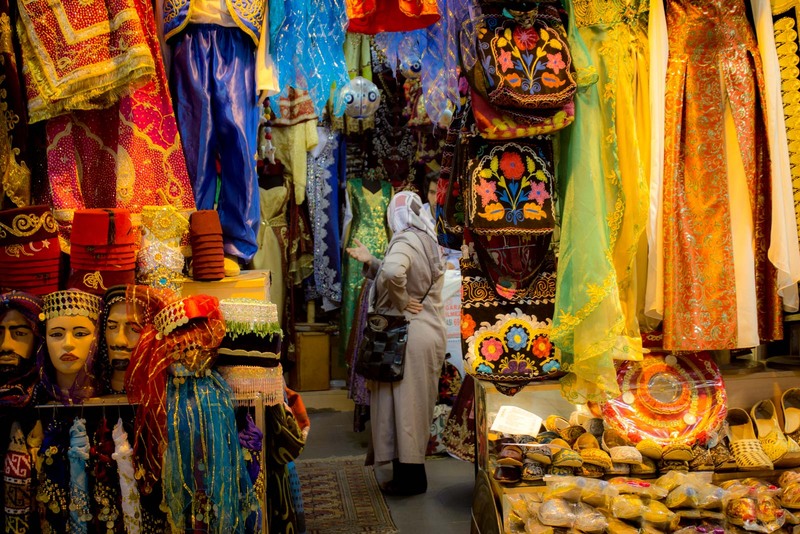 I’d love to visit Morocco someday, and the photos I’ve seen of those markets look a lot like these from Turkey. I think there are a lot of similarities but I haven’t been to Morocco myself so can’t say for sure. 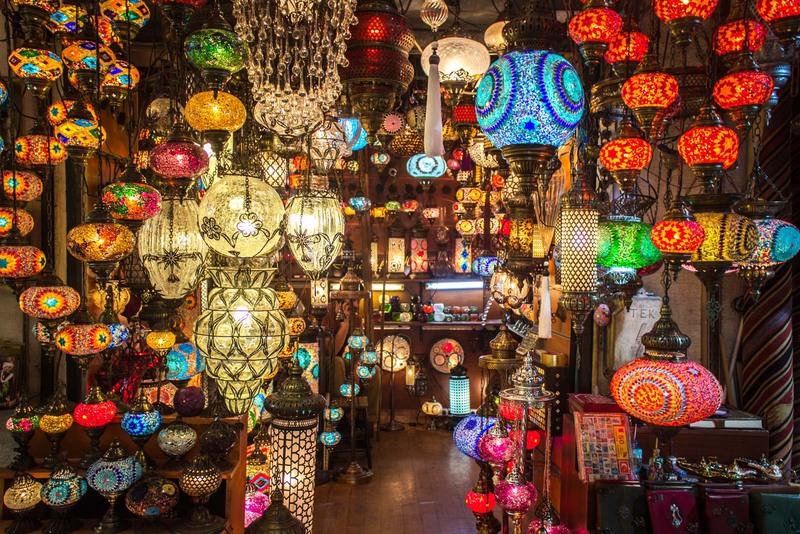 I loved the Istanbul Markets – all the colours and smells, fantastic! 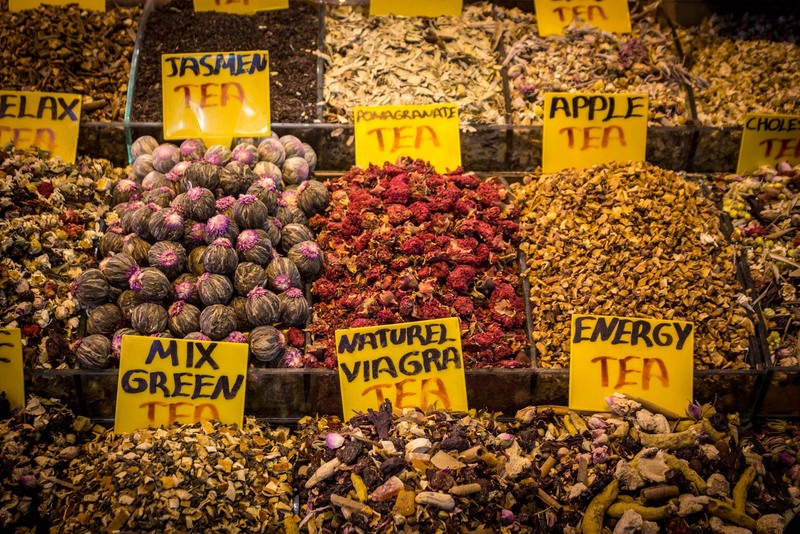 The spice markets were awesome to, especially if you are a fan of Turkish delight. Loved the photos, especially the one with the necklaces. The smells around the spices and the foods are incredible. But it’s the sights that really got me. There is so much to look at and so much to see down every little corridor! Oooh, many colours! A market! SHOPPING!! …Sadly, I am REALLY bad at bargaining, so I would probably be walking aroung with my mouth open and the camera ready to go instead of thinking about making purchases (I mean, so there’s not even slaves. Seriously?? …I kid, I kid.). Whereas your picture of the tea caught me off-guard. I LOVE tea. I would probably buy tea. I’d like some tea right now, in fact. Dear Michael, I’d love to stay, but I gotta go boil the kettle. Mmh. Tea. The colors and textures here are so beautiful! I’d love to go and experience this for myself. Thanks for sharing! The colours are amazing as you wander through the market. There’s so much going on you hardly know where to look!! Those lamps are so beautiful. I love all the colors in these photos, so pretty! Wonderful, should I go back to Istanbul I would dive headfirst into the Grand Bazaar and the Spice Bazaar, I loved them. Those soaps look enticing! There is so much to see. 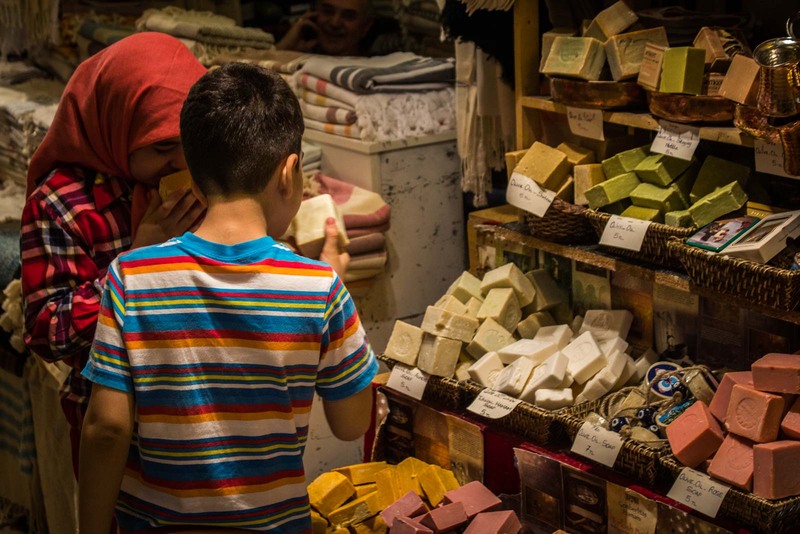 And it’s easy to pick up some little things like soaps at the market. I don’t think I’d want to be lugging around a huge carpet, though!! The market looks like the ones in Sydney. So colorful and alive. You’ve got to go, Bret. You’ll absolutely love the place! 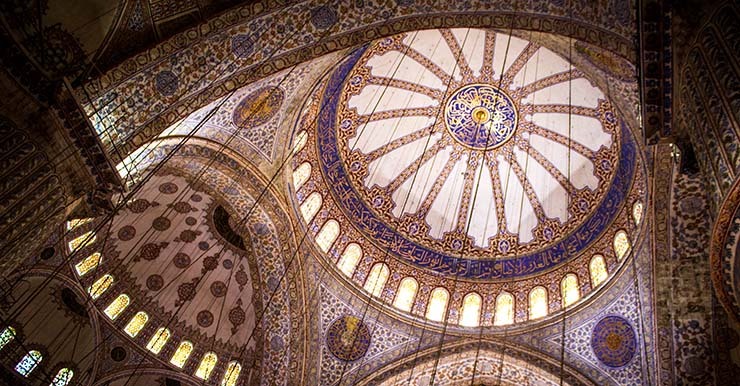 There is so much to see and do in Turkey… this is just scratching the surface! I remember drinking a lot of mint tea in that place. That’s a great selection of colourful photos. Gosh, you just can’t get enough of the mint tea in Turkey!! Amazing photos. I agree that these types of market places always seem more like spectacles than actual places to buy things. Not sure I’d be able to resist those soaps though! The good thing is that you don’t have to resist the soaps – and the people working there will love you for it! The spectacle thing is probably unavoidable, but it’s ok as long as enough people buy some things while they’re there. These photos are positively luscious. Turkey, I will see you someday! I wish I had not been so intimidated when I visited here just after college. I imagine it could be a bit of a scary place if you’re not used to travel in countries like Turkey. All the shouting from the shopkeepers can be quite overwhelming. Wow, this place looks magical! Definitely need to go there someday, markets are some of my favorite places ever! This is the king of all markets! I don’t think you’ll ever find anything quite like it! I will be landing in Istanbul at 4pm on a Tuesday for a overnight layover. In your opinion, would I be able to make it out to the grand bazaar? What time does it close? And if so, what is the best way to get there? It’s normally open only until about 7pm so it might be a bit of a rush for you. It’s right near all the other historic parts of Istanbul so even if you missed the bazaar, you could still see the main mosques from the outside. If you’ve got time, I would recommend trying to head into the city. It’s a really unique and beautiful place. With time constraints, a taxi might be best. I’m looking forward to going there soon. Are there any shipping providers that I may use to ship larger, heavier items back to America in the bazaar? What about near the bazaar? Did you find people walking around and shopping with suitcases in tow? I’m a big shopper! I didn’t really notice anyone with suitcases, as such. but I’m sure there would be no problem doing that. There are so many shops that people seem to check out lots of different shops and then buy things gradually. As far as shipping goes, I can’t give you a specific answer, I’m afraid. I’m sure you would be able to find something nearby, though. If you just ask, you shouldn’t have any trouble.